You already understand the importance of communicating all the details of the benefits programs you offer to employees, including health insurance and well-being programs, as well as new hire orientation and total compensation. Employees that feel in the know are happier employees that are more likely to stay! A Gallup study found that “engaged and thriving” employees are 59% less likely to look for a new job. If you can’t retain employees, the results can be expensive. The Center for American Progress maintains the cost of replacing a highly trained employee is 200% of their annual salary. Making the benefits clear to applicants also makes your recruiting efforts easier – and helps you secure top talent. Score! Effective communication also reduces your risks and liabilities and keeps you in compliance. Each has advantages and disadvantages. Let’s take a closer look to help you pick the right option for you and your project. Freelancers are typically the least expensive option, but sometimes, “You get what you pay for.” You might be able to find qualified freelancers, but you may find you’ll need several freelancers to complete one communications project. Generally, each freelancer has a singular specialty. So, for one project, you’re working with a writer, graphic designer, web developer and more. It’s rare to find an independent contractor with all the skills needed to complete an in-depth employee communications campaign. Your team of various freelancers could be based in different parts of the country or world… and in different time zones. Imagine the difficulty of organizing and coordinating these teams! No one wants to be on a call at 2 am. You’re essentially the project manager in charge of keeping all these freelancers on track. You have to make sure they communicate with each other, that their work meshes well together and that they all meet the deadlines. This can feel like another full-time job on top of the one you already have! A web developer can’t fully create an online portal for employees to check out your company’s health insurance benefits if the writer hasn’t provided the copy. And how many times have you heard from a web developer that the images provided by the graphic designer are the wrong size or file format? There’s a lot of wasted time and effort that comes with all the back-and-forth with freelancers. It’s a real challenge to keep things on track and organized in the best of circumstances. Also, it’s not uncommon for a freelancer to become busy with other projects and start missing deadlines or disappear altogether. You may not be provided with any backup or warning if that freelancer becomes ill or other circumstances prevent them from working on your project. Freelancers can be a viable solution, but be prepared for what you’re getting into - make sure you have the time in your schedule to handle the (intense) project management. When you work with the larger consulting firms (or even insurance carriers), you may feel confident hiring a well-known, trusted name in the industry. For most, employee communication is just one small piece of a larger consulting contract – an “add on” or something that’s “included”. They offer it as a service, but it’s not something they specialize in. And going this route is often an expensive option that may not yield what you would get from a firm that does specialize in employee communications. As a client, often times you have to fit within the consultant’s existing structure – their pre-established templates. Going “cookie-cutter” doesn’t give you the best result, but it’s what is offered or included. With big consulting firms, you’ll also find more red tape, structure, and “rules” that hamper your creativity. Customized approaches tailored to your company’s culture are often not an option. Because employee communication is not the driver of the business for most big firms, you may have junior members of the firm tasked with completing your project. Their level of (in)experience affects the quality of the work – even things like typos may seem small but can present big problems later. It’s not something you should be dealing with when you consider the big bucks you’re spending. Another issue is that you may not have a dedicated team throughout the project that fully understands your goals and the nuances of it. Many of the same issues of working with big name consultants apply here, too. General marketing firms might be industry leaders in many respects. Everybody loves the GEICO commercials, right? But their focus is definitely not on employee communication. They just have too many services to offer to really get into the nuts and bolts of how to effectively engage your team with all the different benefits your company has available. 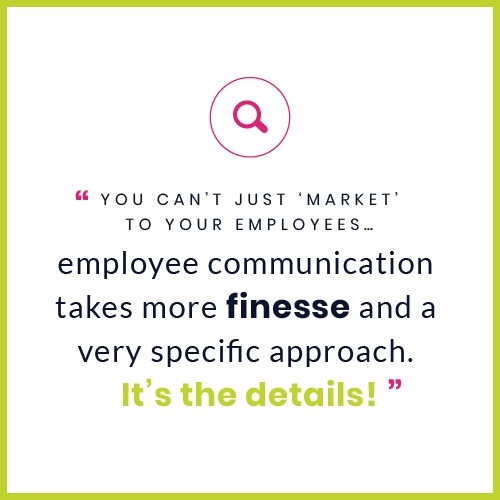 When you hire a firm dedicated to effective employee communication, you can see the differences across the board. These firms are passionate about internal communication – that’s what they know and love to do for their clients. Specialized firms are not just communications, human resources, or benefits experts. They have knowledge, experience, and talented team members in all three areas. A triple threat! And, yes... they know all of this AND how to think like marketers. And even when it comes to “boring” topics like compliance, the best firms strive to get the message out in a creative way to achieve the right outcomes. When it comes to putting together a plan to communicate important information about benefits, compensation, talent development, training and of course building your specific culture… the choice is clear. Hire a firm that is passionate about employee communication and will ask the right questions – that will give you the return on investment and value you’re seeking: relevant and effective communications, employee engagement and participation. The impact on your bottom-line and the ease of completing projects in a professional manner to lighten your – and your team’s – workload is a nice bonus, too.